Slam dunk or flagrant foul? While many of the other consoles of the time were receiving a good variety of basketball offerings, the Neo Geo system was relegated to just one. 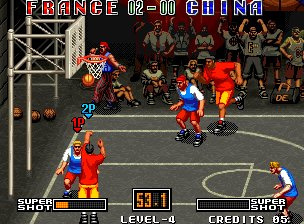 Data East's Street Hoop passed over the traditional basketball experience in favour of a more playground-esque 3-on-3 style, complete with backboard shaking dunks and a wealth of influences from many of the other arcade hoops titles that had come before it. Since the game plays out somewhat like a playground pick-up match, the rules of the game differ slightly from a standard basketball game. There are only three players per team and you won't get a foul call here, something that will allow you to be as aggressive on offence or defence as you want to be. Your goal is to outscore your opponent during the two timed periods of the game to win and move on to the next team. At the beginning, you'll be able to choose from a variety of teams from differing countries, each with their own unique strengths and weaknesses. Some are better at dunks whereas others might be better 3-point shooters or feature better defensive skills. The CPU will choose its own teams, or you can bring in a second player to add a little competitive fire to the experience. As in most basketball games, you'll only control one player at a time on offence and defence. You have one button for passing the ball on offence and attempting to make steals on defence and another button for shooting/ dunking the ball on offence and attempting to block shots on defence. The controls feel very familiar and similar to many other arcade basketball video games, so it shouldn't take you long to come to grips with the control scheme. One unique addition to the gameplay is the Super Shot. As you make shots throughout the game, your Super Shot gauge will gradually begin to fill up. Once it's full, you can then execute a screen-shaking special shot, including a fireball 3-pointer or a flashy, backboard-shaking thunder dunk. It comes off as a small addition, but it's one that does add a little variety to the standard outside shots and various types of slam dunks you'll see throughout the game. The controls tend to be very responsive, but there's very little you can do as far as making and missing baskets. It really depends on how highly-rated your team is as to what percentage of chance you have of making your shots and dunks. The same can be said of how likely you are to get a steal on defence as well. The simple control scheme makes the game easy to pick up and play and if you can round up a second player, you'll probably get far more out of the experience than taking on the sometimes streaky and, at later levels, cheap single player AI. The visual experience is fairly standard and about what you'd expect from a 16-bit era basketball release. There are a host of different courts to play on, each with their own unique visual theme and the players themselves are nicely detailed and animate quite smoothly, especially when they execute one of their flashy Super Shots. The hip hop soundtrack the game employs will seem a bit out of place at first, but it soon blends in perfectly with the playground atmosphere. The announcer is also surprisingly coherent and does a nice job of calling the action without becoming overly annoying or cheesy. A few additional music tracks would have added some nice variety to the mix, but this certainly doesn't detract much from the overall experience. There's no denying the heavy Double Dribble and NBA Jam influences that abound in Street Hoop, but given how well those arcade hoops classic played, that's certainly not a bad thing. 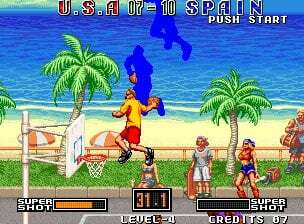 The game's unique hip hop musical score and over-the-top Super Shots give it something to stand out from the crowd, but what ultimately makes the game so much fun to play will inevitably be its familiar controls that will give fans of popular arcade hoops games something new with which to play. At the very least it proves that the Neo Geo system was capable of producing quality titles that were actually not fighting games. Oooh, a 90's Hip Hop soundtrack on Neo's sound ship? I'm in! Need to get some more Neo Geo on my Wii anyhow. Nice review Corbs! "At the very least it proves that the Neo Geo system was capable of producing quality titles that were actually not fighting games." It's oddly emulated, at least the PAL version is. The vocals in the music tracks are slightly out of sync with the beat. Hopefully the US release will fix this. 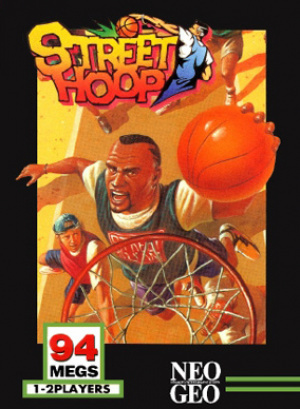 Easily one of my favorite Neo Geo titles next to Windjammers though. Corbie and his 5 Metal Slug MVS carts say "hi" back. When you pass the ball on offense with no human teammates, do you switch control to the player that now the ball? 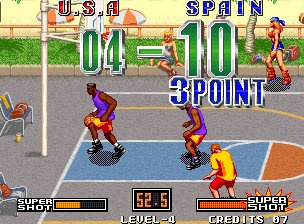 I like the pixel graphics, but NBA jam is enough basketball for me right now. How come Corbie writes a VC review of a game not currently out in the States? I thought he only has a NA Wii. @KeeperBvK: he also has a JP Wii iirc. Corbie has 3 Wii consoles. And he loves them all equally. Well maybe not equally, but close. Or people with good spelling are. "Defense" just looks wrong. Very good game to play with friends. It's addictive and fun, a perfect arcade street basket game. The wiiware's hoopworld has a similar gameplay. "Whoa, Corbie is referring to himself in the third person", thought StarBoy aloud. I played through this game in single player to the credits this weekend. It's fun! The graphics are nicely done and the challenge is good, however as the review mentions you have little influence over your shots so higher AI difficulties are presumably nothing more than raising the comp's shoot percentage variable or lowering yours. I found myself in a bit of a rut always going for three pointers (having chosen a team excelling at them) and leaning on the steal defense more than the block. Time with a contrasting team will tell if this was my own handicap or if different teams really do influence play styles. A couple of times the game didn't select the right player for me and I couldn't help but think one of the two unused buttons could have handled that function.